Reciprocal linking is when one site links to another and vice versa. Often this happens when two businesses that use each others services, (who both have websites) link to each other. For example, Toolkit Websites (Web Designer Southampton) has a link to Eazipay's website and Eazipay reciprocates by linking back to Toolkit Websites. A year or two ago, this SEO strategy was widely used with the mindset of increasing your websites search engine results page rank. The idea was so that people would click on the link on your friends or business partners website, and land on yours, therefore increasing your traffic and potentially your sales. Search engines such as Google, soon realised that reciprocal linking often meant that search results were becoming blurred. If you search for a wedding events company, you don't expect to then land on a car servicing website. You expect to find the results you are looking for without much effort and with high accuracy for the search terms you have entered. Search engines want to bring you the most relevant, and useful results meaning that reciprocal links were defeating the purpose. In order to fix this and standardise it, search algorithms were updated, refined and became more complex. This meant that reciprocal linking slowly stopped being a common practice. Those who were cramming their websites full of useless and pointless links would see their search results suffer and websites were being penalised for this practice if it was being used as a black hat technique. A lot of people are now unsure about whether reciprocal links should be used, and are worried it will cause negative results for their search engine optimisation. However, reciprocal linking is still a valuable tool if it's done correctly. There are still instances when reciprocal linking is beneficial for a business, especially when it’s used as an online business strategy to gain visibility or new business. The key is to find a strategic partner who shares the same target market as you but that offers a different or complimentary service. By linking to one another, you’re sharing each others’ resources, content, and offerings with a target audience that will appreciate the link rather than find it irrelevant. This approach works because the links are to relevant sites, or relevant content, which is what both consumers and search engines are looking for. A florist and a car servicing company because they are on the same road. If the link seems forced, unnatural, or out of place, it probably is and shouldn’t be used. 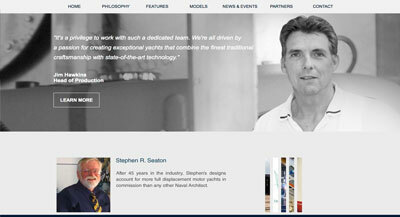 Our Team are delighted to bring you our Website of the Week this week. It is one we are truly proud of - showcasing everything from stunning full width images, bespoke movement and just pure customisation across the board. Every page was given special treatment and exploring its pages is a pleasure. There is so much to talk about in the case of this website that this writer feels the need to break everything down for you with a page by page analysis. The Home Page is the clear crowning glory of this entire venture. It's hard to put into words how beautiful the client's own logo and yacht image looks, sitting in this landing section. It declares all things bespoke, luxurious and conjures ideas of international travel and vast oceans to potential clients of Cape Scott. The website features an all round 100% design with coloured panels as well as images - and the Home Page is no exception. 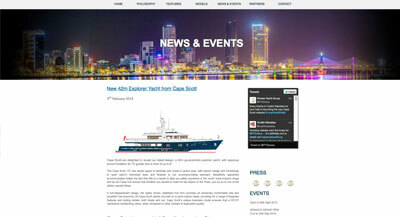 Using the scrolling function on the arrows (try it now) the website carries you from the opening yacht image to the lovely black and white photo of Dan Fritz, President of Cape Scott Yachts, as if on a gentle current. The website and Home Page also makes use of a subtle fixed menu for easy navigation, ghost buttons and black and white hover over display on its images. Moving onto the Philosophy Page, you will immediately notice that the image at the top is different. This is a choice of function as well as design. Not only is each page bespoke but this means that the more informative internal pages are easier to absorb without the need to move around the page as much. 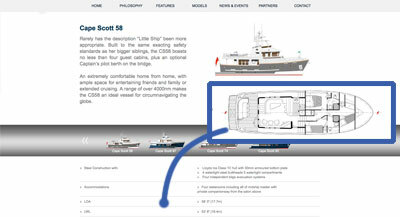 The Features Page uses an interesting Image Map as its header image and a bespoke, alternating page dressing to organise the components of its yachts. If you click on any of the question marks at the top of the page, a pop up window will open, sharing more information on that particular feature. 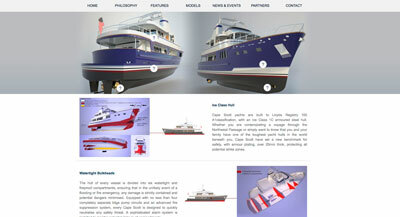 The Model pages raises the bar even further using a custom built carousel AND fade scroller. The 100% wide carousel showcases all of the other models in the range making navigation much clearer and easier for customers perusing for a yacht. The fade scroller at the bottom of the page goes into even more detail with ever changing beautiful blueprints of the products. This page is something we like to call a 'Bespoke Blog page' which means it can be easily updated in the Toolkit with any links and stories Cape Scott want to share. 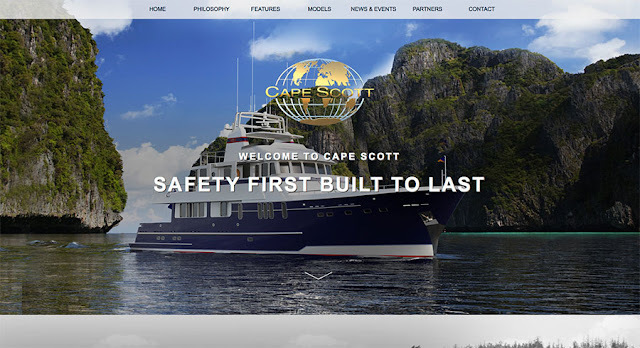 In this case, the page features another custom header to make the most of the bespoke design and a Twitter Feed demonstrating that Cape Scott is a very active and vocal business of today. There's even more movement on this page from the Scrolling Up scroller, displaying news stories as and when they happen. And finally we come to the last page I'm going to talk about in this blog. Yet another artistically styled custom header image and one more noteworthy feature. 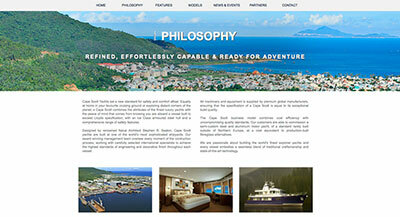 At the bottom of the page you will notice a custom Accordion Slider, each slide representing a partner of Cape Scott. Not only does it create a nice motion but it's great for external and reciprocal linking which will help the website in any Search Engine Results. The whole team here urges you check out this website for yourself and experience everything it has to offer. If you see anything you like here and would like to see it on your own website, don't hesitate to get in touch! We'd love to hear from you.